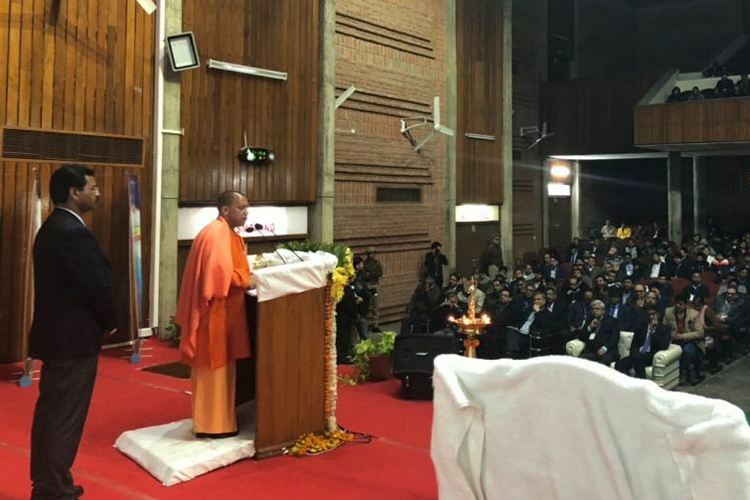 In his address to students, professors and entrepreneurs at the Indian Institute of Technology (IIT), Kanpur last Saturday, the Chief Minister of UP, Yogi Adityanath, said that his administration “will link 60,000 villages of the state with the Start-up India programme and technology will reach the villages, so that the villagers can get employment from their home itself”. The CM also said that the villages will soon be linked via optical fiber network, so as to allow rural folks to reap the benefits of high-speed internet. According to the CM, the only reason the state is finding it difficult to bring technology to these areas is lack of funding. “We have to make technology affordable”, he said. Adityanath also said that in order to generate jobs in villages, every gram panchayat will henceforth have one coordinator to link youngsters with the Startup India scheme that aims to create more jobs by helping and encouraging youngsters to take up self-employment. organized jointly by the Alumni association of the IIT Kanpur, entrepreneurship cell of the IIT and the UP government. He took the opportunity to encourage students to become employers rather than employees by staying back in the country and generate employment in their villages rather than migrating to the cities in search of jobs. An MOU was also signed on the occasion between IIT, Kanpur and the APJ Kalam Technical University, Lucknow, whereby the former will provide technical training to AKTU students through online courses. As per the MOU, the two educational institutions will jointly initiate activities around identified domains to raise the standards of higher technical education in UP.